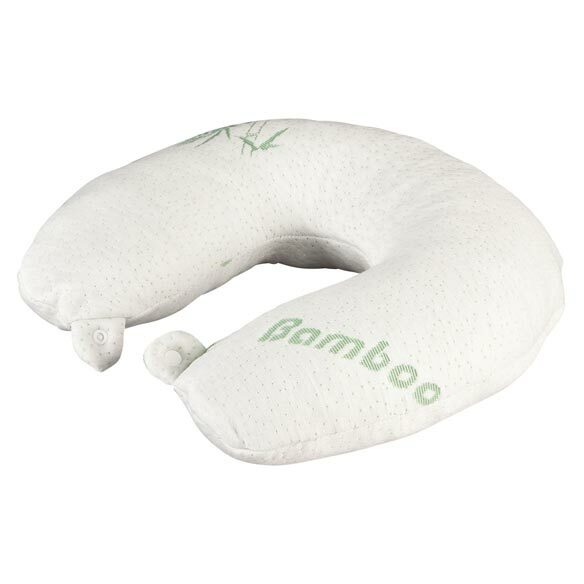 Memory foam neck pillow with bamboo cover treats your neck to the firm support of memory foam covered with luxuriously soft bamboo fabric. Made with hypoallergenic, antibacterial materials to help you breathe easy, it features a zip-off, hand-washable bamboo cover. Perfect for relaxing at home or while traveling, this lightweight, portable pillow fits in most carry-on bags. This was a excellent purchase,it assit me in specially when i sleep in my chair. Keep my neck straight and keep me from getting a headache. I have neck problems, use this pillow in mt lounge chair. like to see if it will help me with my neck. For a long time, periodically, I woke with neck pain. Don't think pillows would solve problem. Tired of having to use heating pillow around neck, to relieve pain. I'M GOING TO TRY THIS, BECAUSE I SLEEP AND WATCH T.V. ON MY SIDE AND NEED SOMETHING TO PUT UNDER MY HEAD AND NECK. I have so much joint pain that I sometimes need to sleep sitting up. I believe this item will cradle my head and neck for more comfort. Due to my continuous neck pain and most neck pillows causing my neck to be too hot, I am hoping this neck pillow will eliminate the pain and not cause the continuous sweating. I bought this for my husband as he absolutely refuses to consider a cpac device for snoring. He likes it a lot. Love this memory foam neck pillow!!! Made another purchased for a family member. Is the pillow to firm to shape to your neck or does it soften some to be more comfortable? BEST ANSWER: I love this pillow. I had tried several others and they always were to big or the material made be too hot to sleep. I adjusted to this pillow in a couple of nights and I absolutely love it. What is the length of the pillow? BEST ANSWER: Thank you for your question. It is 30” long from end to end. We hope this information will be of help to you.